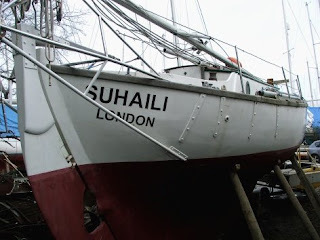 After the post about Suhaili (and I suspect a little mention from Messing About in Sailboats) my little blog received a huge increase in hits, so thank you everyone who visited and I hope you found our quiet corner of England interesting. 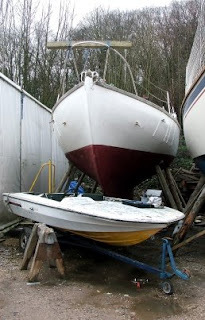 One of the things I like about Bursledon is the connection with the history of yachting. Just a few yards from Suhaili is China Blue of Hamble. This boat isn't quite as famous as Robin Knox-Johnston's ketch, she is from the same tradition of English Corinthian seafaring. China Blue has been ashore for a few months, but last week I was lucky to find owner Tim hard at work getting ready for the Easter launch. She is a sister ship to Jester a reworked folkboat sailed by Blondie Haslar, which he developed for single handed sailing. Radical features were the completely enclosed accomodation (slightly reminiscent of a world war two nissan hut) and the Chinese Junk Rig. The combination of these two elements allowed the boat to be sailed from the comfort of the cabin and was a major safety feature offshore. Jester was one of four entries in the very first OSTAR - Observer Single handed Trans Atlantic Race in 1960, legend has it that the race was founded on a bet for "half a crown" (two shillings and sixpence in the old UK currency, equivalent to 12.5 pence now) between Haslar and Sir Francis Chichester. Two other entrants, David Lewis and Val Howells joined the race, which ran from the Royal Western Yacht Club in Plymouth to New york (although subsequent OSTAR's have finished at Rhode Island). The original Jester was purchased by Mike Richey after the 1964 OSTAR and raced in subsequent OSTAR's until she was sadly lost, although Mike survived the sinking. China Blue was built at Blyth yacht Club in the early 1980's to the same design as the original Jester. The spirit of the original OSTAR, single handed, self sufficiency has given way over the years to huge sponsorship, huge budgets and technical sophistication. As a counter measure and to build on Blondie's original intention a new race has been formed "the Jester Challenge". In a bid to recapture the very essence of ocean voyaging, there are no entry fees, no judges, no committees, no scrutineering, and no real limits, with the exception that all boats taking part should be under 30ft. 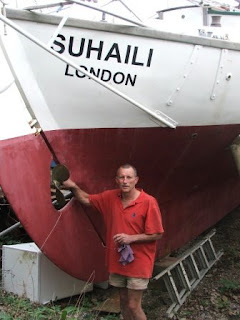 Tim has sailed four OSTAR's himself and is preparing China Blue for the 2010 Jester Challenge. He was also unaware that Suhaili was only a few yards away and took a break from his work for a photograph by the famous yacht. I also learned from Tim, that Blondie lived locally, just across the river in Swanwick, before moving to Bursledon and then Curbridge a small village at the top of the river. A recent post on the Messing Around in Sailboats blog recently reminded us that 2009 is the 40th anniversary of the Golden Globe race, the first around the world, single handed, non-stop circumnavigation. The race actually started in 1968, but April 22nd 1969 was the date when the then young Robin Knox-Johnston became the first man to circumnavigate the world non stop arriving in Falmouth after 312 days at sea. Knox-Johnston famously and to his absolute credit, donated his £5000 prize to the widow of fellow competitor Donald Crowhurst, who had tragically committed suicide during the race. So what you may ask, has that got to do with this blog? Well, while my own boat has been ashore in a local boatyard over winter, I've been walking past this slightly sad looking yacht. No clearly not the yellow and white run-about in the foreground. Those of you familiar with Knox-Johnston's Suhaila will find her if not instantly familiar, certainly recognisable. And here's the proof point. Mystery Lines in Hampshire Garden?? Over winter this strange line has appeared in the garden. It’s unnaturally straight and so we wondered if it might be part of an ancient “lay line”. More cynical friends suggested that maybe it was the latest iteration from the corn circle hoaxers? However further investigation suggests an altogether more down to earth cause. It simply marks the path our local squirrel population have been using between the oak tree and the bird table. Their constant use has worn the grass completely away. 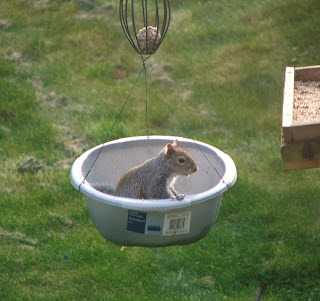 So not any supernatural manifestation, it is more a warning sign that we're overfeeding our garden visitors. Might wildlife obesity become a problem!! Talking about the weather is a very English thing and the past weekend certainly gave us something to talk about. Saturday morning, fine and warm hinted at a nice day in prospect. I was busy with other things, so by the time I got down to the boatyard in mid afternoon it had turned cloudy and cold, a chilly wind had set in. I walked home past the hard just as the members of the Dinghy Cruising Association were recovering their boats. 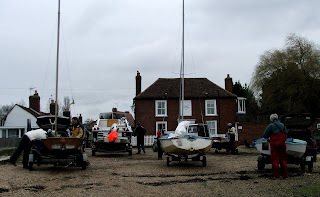 The small party consisted of a couple of Wayfarer's, two smaller boats which looked like Wanderer's (the smaller 14 boat also designed by Ian Proctor) and a Mirror dinghy. DCA members had travelled from Guildford, Farnham and Bordon. Launching at Swanwick Hard up by Bursledon Bridge. 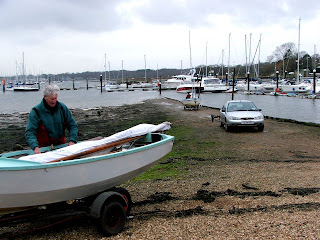 They sailed, down the Hamble River and across Southampton Water to Calshot , returning a couple of hours after low water to recover their boats. 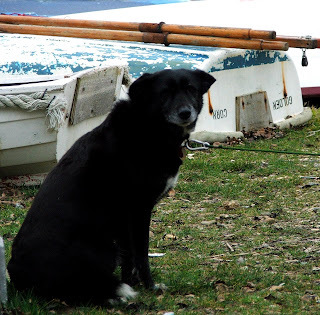 Gem the dog waited patiently while the boats were loaded onto the trailers. We woke in the middle of Saturday night to hear rain lashing at the windows and the wind whistling down the chimney as the forecast gale swept through. Then Sunday morning dawned with clear skies and bright sunshine, so I took the opportunity for an early morning row down the Hamble. The river was deserted apart from a few Sunday morning race crews getting their boats ready to race in the aptly named RSYC Frostbite Series. Some of the local wildlife were making the best of the day; a group of crows had found a comfortable spot perched on top of the masts of a few boats in the river. These boats were all moored where a bend in the river gave them shelter from the wind. The crows were perched at the mast heads, high enough to catch the first rays of the low winter sunshine as the sun rose over the nearby woods. I counted 14, one or two per boat, of these clever crows. With the rowing boat put away, I’d worked up something of an appetite so we went down to Stokes Bay to one of my favourite cafe's for a very late breakfast. On the water the local Laser fleet from Stokes Bay sailing club were out in force and enjoying the brisk conditions as the clouds which signalled the next depression swept in. The local forecast was rain by 13.00 as the tail end of a depression whipped up from the channel, sure enough at one fifteen it started raining, by then we were sitting comfortably indoors. If our weather was mixed, have a look at thye posting on South West Sea Kayaking just down the coast in Dorset. Well actually quite a lot. I was recently in discussion about a prize that is to be offered for the first “Yawl” to finish a race for traditional and working boats. Sounds pretty simple, because most sailors know what a yawl is, right? Well maybe not. The yacht club bore piped up "what's the problem, a yawl has the mizzen aft the rudder stock, a ketch has it forward !" Well that may be a widely accepted definition, but if we agree that premise, then no boat with a stern hung rudder could be said to be yawl rigged – where would the mizzen go? Since the prize was offered by the family of someone who famously sailed (well famous in local circles) a yawl rigged working boat of precisely this type, that couldn’t be correct. 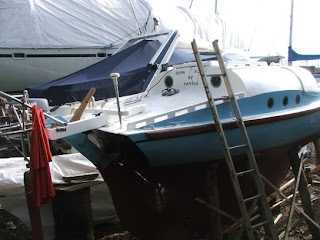 Perhaps one of the most famous of this type of working boats is the Falmouth Quay Punt - stern hung rudder, therefore the mizzen must be forward of the rudder post - sorry can't be a Yawl - hmmm. More curious still, take the Salcombe Yawl – oops that too has the mizzen forward of the rudder – what a dilemma, maybe they need to rename it the Salcombe Ketch!! Given that so many English working boats had both a stern hung rudder and a small mizzen, maybe the position of the mizzen relative to the rudder isn't the whole story. This seems to be confirmed by some further research. yawl / yôl/ • n. a two-masted fore-and-aft-rigged sailboat with the mizzen boom overhanging the stern. 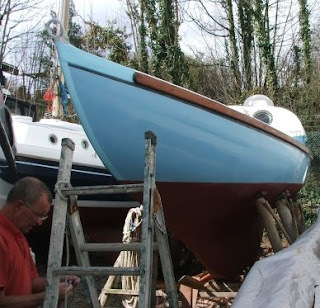 Well that's a possibility which offers more flexibility and accommodates the many traditional working boats with the rudder fitted to a transom stern. But, while this description relieves the problem of mizzen location relative to the rudder, I’ve seen plenty of ketches where the mizzen overhangs the stern, so this can’t be correct. The famous American Naval Architech Francis Herreshoff appears to support the view that relationship between rudder and mizzen are not critical when he states: “"Yawl had nothing to do with rudder placement relative to the mizzen - a yawl rig is the sail and mast configuration that suits a Yawl boat". A helpful if a somewhat circular argument, but you have to take Mr H seriously. One of the problems seems to be that the accepted use of "Yawl" comes from the yachting fraternity, where the counter stern has been common place since the beginning of the 20th century. Stepping the mizzen on the counter stern, behind the rudder made sense and avoided all the complicated and un-yacht like contrivances such as a cranked tiller, which is necessary if the mizzen is stepped immediately ahead of the rudder. This influence from “yachtsmen” was also very strong in America, where Yawls came into prominence under the CCA rating rule in the 1950s. The CCA rule did not measure the sail area carried between the main and the mizzen. This meant that the added sail area of the mizzen staysails or mizzen spinnakers was free of any rating penalty. These designs were most definitely yachts with counter sterns and the mizzen stepped behind the rudder. Memorable examples are Ondine, Figaro, Maruffa, Escapade, Dorade, Sabre and Carina II. All clearly Yawls by any definition. Not surprisingly some designers took things to extremes, Bill Luders created a yawl that had no mainsail and sailed under genoas and mizzen flying sails. It was called Storm, and without a mainsail, it had a very low rating and won everything in sight. 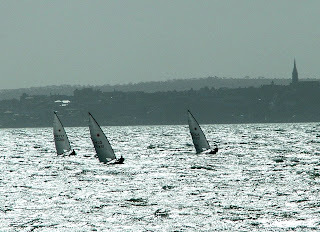 This upset the rule makers so they changed the rule to require a mainsail. Next season Luders showed up with Storm — at 44 feet LOA — sporting a mainsail the size of a Laser's. He won again. Going further back to the early part of the 20th Century, Henry Coleman Folkard, in his book Sailing Boats from Around the World; says of the yawl rigged boat, “the mizzen is stepped further aft (than the ketch) near the stern post - and is much smaller in proportion to the mainsail (in comparison with a ketch mizzen)”. This seems a most useful definition for our purpose, which applies to working craft and yachts alike. Coleman Folkhard was enthusiastic about the yawl rigg in his summary "For comfort and convenience the yawl rigg is one of the best and handiest that is known, whether for yacht or pleasure boat large or small” – he goes on to say -“ it (yawl rigg) is admirably adapted for a shooting or fishing yacht; in fact no better rigg is known for either purpose". In summary a reasonable description of the yawl therefore might be “a two masted fore-and –aft rigged sailing boat, where the mizzen is smaller than the main mast and is stepped close to the rudder stock; and where the mizzen is small in proportion to the mainsail”. Or at least it might be if it were not for the fact that Francis Herreshoff , Coleman and others distinguish between yawl and yawl rigged. If then our definition above describes a “yawl rigged “ boat what then is a yawl? Warrington Baden-Powell commenting on "canoe yawls" in Forest and Stream, 10/17/1889: refers to -" a double ended boat as used by a man-of-war similar to a ship’s jolly boat or pinnance, normally rowed by four to six oars". "A work on naval architecture of 1793 describes the 'yawls' carried then on men-of-war 'for sailing and rowing' (like this one on Gavin Atkin's In the Boatshed Blog)as practically of a form we should now call whaleboats, i.e., sharp at each end; and further, the same authority says of the Norway yawl: 'Of all such boats this yawl seems best calculated for a high sea; it will venture out to great sea distances when a stout ship can hardly carry any sail." 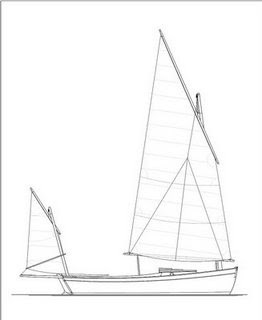 In conclusion are we agreed, the yawl being a type of boat while yawl rigged describes the sail plan which accommodates both yachts and working craft? 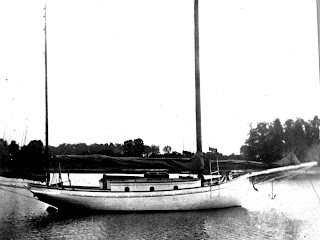 Here is a delightful 1903 Long Island Oyster Sound Sloop looking very much yawl rigged. And finally my favourite is “Favourite” a “Whitstable Oyster Yawl” which is certainly not a rowing boat. Nor according to the restoration team is it yawl rgged. “Favourite is an oyster yawl. The rig, perhaps surprisingly, is a gaff cutter and not a yawl which would usually mean a second smaller mast abaft the rudder post. As far as we know few, if any, of the Whitstable oyster yawls had a second mast rigged as a true yawl. We do not really know the origin of the term yawl in this usage - can you help?" If you have comment or input on any of the above I’d be delighted to hear from you.